A kind of sci-fi horror, Jeff Vandermeer’s work is thought provoking and challenging. Two themes that have recently grabbed my attention are those of ‘object-oriented ontology’ and ecology, both extending from my study of the sociology and politics of technology. Because technology is separate from us, as in not-human in its essence, and yet artificial intelligence is trying desperately to make these non-human objects assume human characteristics, it is important, I think, to understand why we would want to do that. Object-oriented ontology seeks to reject anthropomorphism, and instead look upon the world as a collection of objects, with no special status attaching to humans; it is not clear to me if any special status attaches to the subject. Ecology is interesting because it seems to be the opposite of the inclination of technology to unilaterally dominate, to overpower, to understand. Technology extends the human mostly-male power impulse, designed as it is to subdue the environment, to control the world, including human beings themselves. When technology fails, it is entirely bewildering – and men insist on finding the reason. When the light switch does not illuminate the room, the man goes to the fuse box. Finding no answer here, our hero reaches for a torch and finds a spare bulb. With still no resolution, the electricity company is called – and on it goes. The man seeks to resolve the problem not merely because control over the environment is in some sense ‘man’s work’; but because the thought of not finding a rational, scientific answer to why the room remains dark is quite terrifying. The ecological view of the world suggests that there are other reasons as to why the room remains dark, non-scientific reasons, and therefore in some way perhaps unknowable reasons. 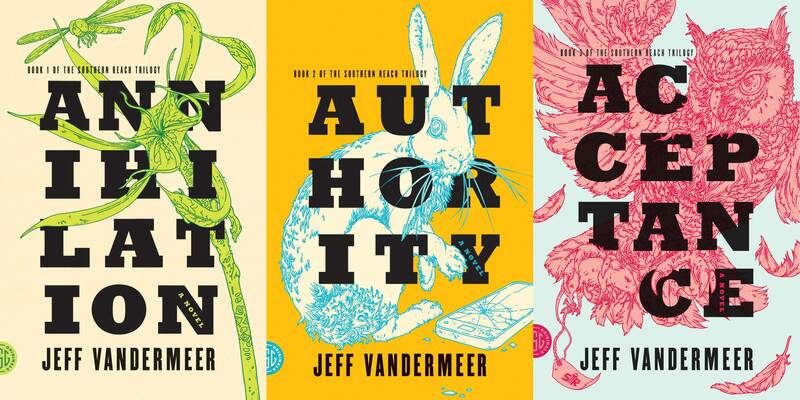 Jeff Vandermeer’s Southern Reach Trilogy – Annihilation, Authority and Acceptance – is about a mysterious place where there has been some kind of ecological disaster. Within that place – Area X – the laws of science don’t behave as they should, in several ways. The primary visceral representation of this is in the rate of decay – buildings and corpses and man-made technologies are consumed by the fields and the forests of ‘Area X’ far quicker than would normally be the case. The first book deals with a woman – the biologist – and her journey through Area X, as a member of a multi-disciplinary team sent in to investigate. The second deals with a man – who goes by ‘Control’ – an officer newly appointed to lead the government agency called Southern Reach that manages the site, and the investigation teams. The third resolves many of the stories from the first two books. There are hints at early brutish attempts to subdue Area X, primarily using military means, but these novels are set thirty years after the event, and at a point in time where Area X seems to be contained, dormant, but still not understood. The biologist explains that ‘we think in terms of machines, not animals. The enemy doesn’t acknowledge machines.’ It is as if all of our human technology has failed, and there’s no science that can help us to understand why. Our most powerful force of expression as human beings is our technology, and yet this ‘enemy’ (it is never clear at any stage whether Area X is actually threatening, even though it’s pretty scary) doesn’t even acknowledge technology. These are cross-dimensional misalignments, forces from entirely different planes of reality. Vandermeer claims not to have been influenced by the Russian science fiction work of Tarkovsky and the Strugatsky Brothers, though there are echoes of Stalker and Roadside Picnic here. He certainly has been influenced by Lovecraft and the early twentieth century writers of the Cthulhu mythos, a horror sub-genre that has grown in its relevance as modernism has evolved. All of these works are alien, both in the sense of placing the human subject beyond his natural realm, and in the sense of animating the non-human. There is no redemption in Vandermeer’s trilogy, no forgiveness for the failings of imperfect humans. Yet Vandermeer’s work is genuinely rewarding as a new way of seeing, a kind of visceral realism (with apologies to Roberto Bolano) that attacks hubris and shuts down fanciful notions, such as that of the Anthropocene. ‘We must trust our thoughts while we sleep. We must trust our hunches,’ one character explains. This is the new real. There remain many unanswered questions. There are vignettes unresolved, lives that continue on into something else. Though by end of the third book, they seem unimportant, as if their stories are rendered meaningless by the realisation that the context for those stories was either wrong, or will forever now be changed. This is by no means an unsatisfying conclusion. These books were published in 2014, two years before Trump, and Brexit, and all of that. I acquired them in 2015, but only read them this year when the LA Review of Books made the connection between Tim Morton’s concept of Dark Ecology and Vandermeer’s fiction. In our bewildered times, where our understanding of logic and science is tested by the counterintuitive on an almost daily basis, we need new ways of seeing. For things cannot be as they seem. Right?